All information on the metro and public transport in Rome metro lines, tickets and tourist passes in Rome. BIT Ticket: This ticket costs 1.50 € and allows you to use public transport for 100 minutes after you stamp it. You are only allowed to make one trip by metro or train. Roma 24H Ticket: This 7 € ticket allows you to travel freely all day until 00:00 am. Roma 48H / 72H Ticket: With this ticket you can travel 2 days for 12.50 € or 3 days for 18.00 €. CIS Ticket: With this ticket of 24 € you can travel 7 days. A better map of the center of Rome with the metro stops can be found here. This article describes in detail how you can reach the center of Rome from the two airports Fiumicino and Ciampino. Certain tourist locations, such as Trastevere, are far from the nearest metro stop. There is an extensive network of city buses you can use for these. They use the same tickets as the metro. Tickets (same as for the metro) can be purchased from the ticket machines at the metro and bus stations and at tobacco and newspaper shops. Do remember to stamp your ticket; after stamping it, you can use the bus for 100 minutes and change lines if necessary. The route planner for the city buses can be found here. The convenient thing is that you can already book your tickets online and show them on your mobile phone when you get on the bus. You will not have to stand in line at sales points for tourists and just step on the bus with your mobile ticket nice and early. 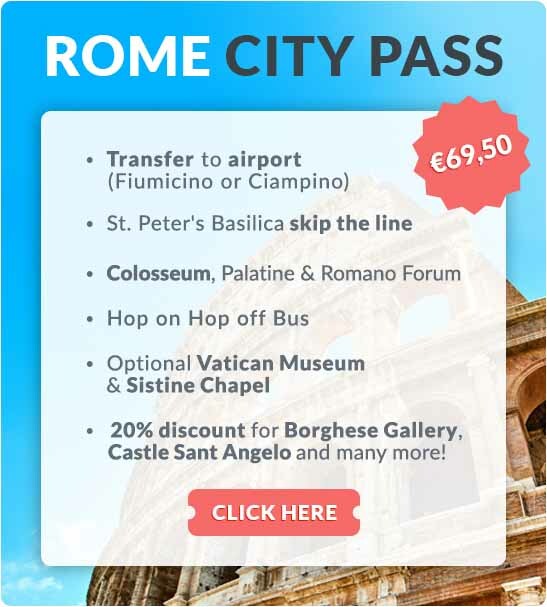 The popular Rome City Pass: The Rome City Pass is a combined ticket for all the tickets you need for your city break to Rome (includes Colosseum, Forum Romanum, St Peter's, hop-on-hop-off bus, Sistine Chapel). From 67,50 €. Info & Bookings. In addition to the red buses, there are also the yellow ‘Vatican & Rome’ buses. This organisation came up with a ticket that is ‘all inclusive’. You can use their hop-on-hop-of buses for 24 or 72 hours without limitations, as well as public transport (metro and trams). The advantage of this ticket is that there are 16 stops (see map), and the route is larger, which means sights such as the Vatican and the San Giovanni in Laterano have closer stops. You will receive the ticket for the hop-on-hop-off bus per email. You will have to exchange the public transport ticket for a physical one. Book your tickets here. 48 hours 28 € including 1 attraction. Reservation & info. 72 hours 38,50 € including 2 attractions. Reservation & info.